Preheat the oven to 325°. Butter a 6-cup soufflé dish or other deep baking dish. In a large skillet, melt 1/2 tablespoon of butter over moderately high heat. Add the spinach, water and garlic, season with salt and pepper and stir a few times. Cover and cook the spinach until it wilts, about 2 minutes. Set a colander over a bowl and drain the spinach; press very lightly on the spinach to extract 1/4 cup of liquid. 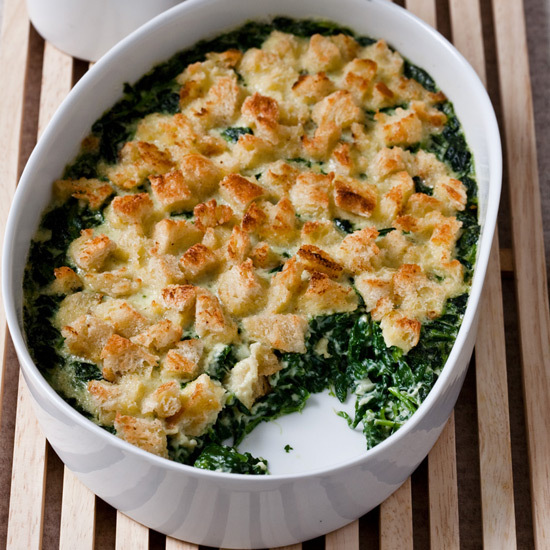 Spread out the spinach on a rimmed baking sheet to cool. Heat the remaining 1 1/2 tablespoons of butter in a large skillet. Add the diced bread and cook over moderate heat until browned on the bottom, about 3 minutes. Stir and continue to cook until the croutons are crisp all over, about 2 minutes longer. Transfer the croutons to a plate to cool. In a bowl, whisk the eggs with the cream, reserved spinach cooking liquid, 1/2 teaspoon of salt, 1/8 teaspoon of pepper and the nutmeg. Stir in the spinach and pour the mixture into the prepared soufflé dish. Spread the fried croutons evenly over the top. Set the soufflé dish in a roasting pan and pour enough hot water into the pan to reach one-third of the way up the side of the soufflé dish. Bake the bread pudding for 35 to 40 minutes, or until set. Let the pudding cool slightly, then serve directly from the soufflé dish or invert it onto a platter and serve. The recipe can be prepared in advance through Step 3. Refrigerate the spinach, and store the croutons in an airtight container, overnight.